Last weekend, we took a trip to Austin. It’s only a 3 hour drive from Dallas. I love Austin and I want to live there someday! Austin is not anything like the rest of Texas. PETA recently voted it the best city for vegans. 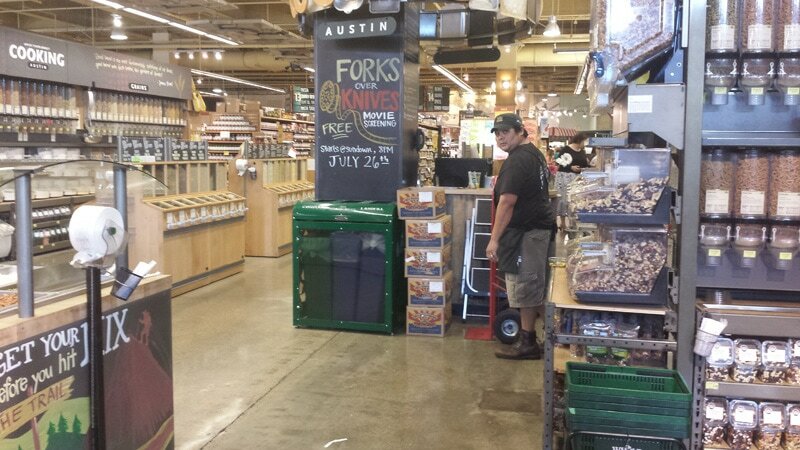 Austin also is the home to the Whole Foods flagship store. It’s freaking huge at 80,000 square feet. We were super excited to check it out. So before we left, I had to pack some snacks and food to take with us to the hotel. 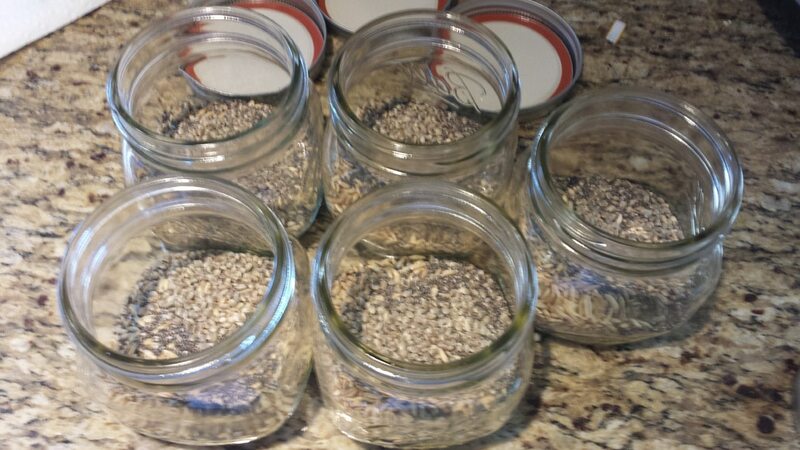 I made a few jars of my overnight oats for us to have for breakfast in the hotel. I also packed some of my Peanut Butter Donuts. They are awesome for traveling. 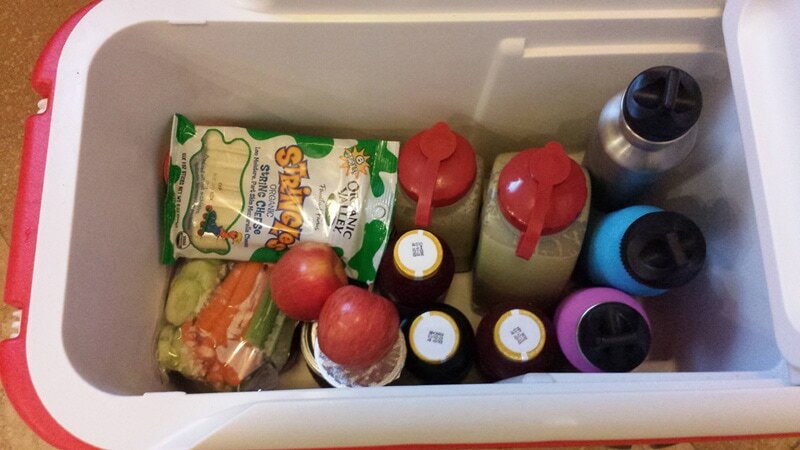 Here is a cooler full of everything we brought with us. Chopped veggies, fruit, yogurt, cheese, water, kombucha tea and my daughter’s homemade blended formula. That is the green stuff in the jugs. My older daughter snacked on an apple and a cheese stick for the drive down. We were pretty hungry when we finally got there and the first place we stopped at was Mother’s Cafe. They serve vegetarian and vegan food. 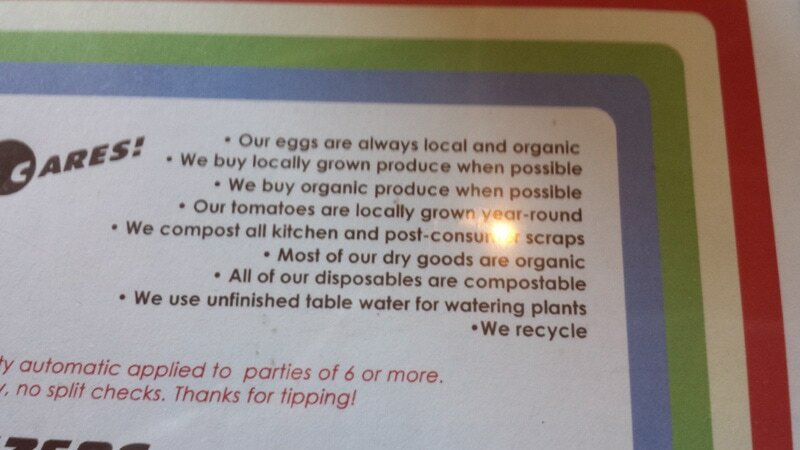 A lot of their food is organic as well. I was super excited to see they had a homemade veggie burgers so that is what I got. With avocado of course! 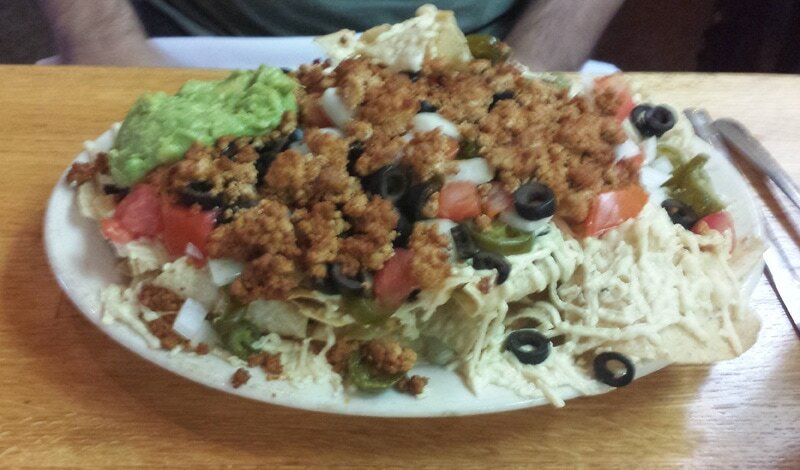 My husband got the nachos. Talk about freaking huge! 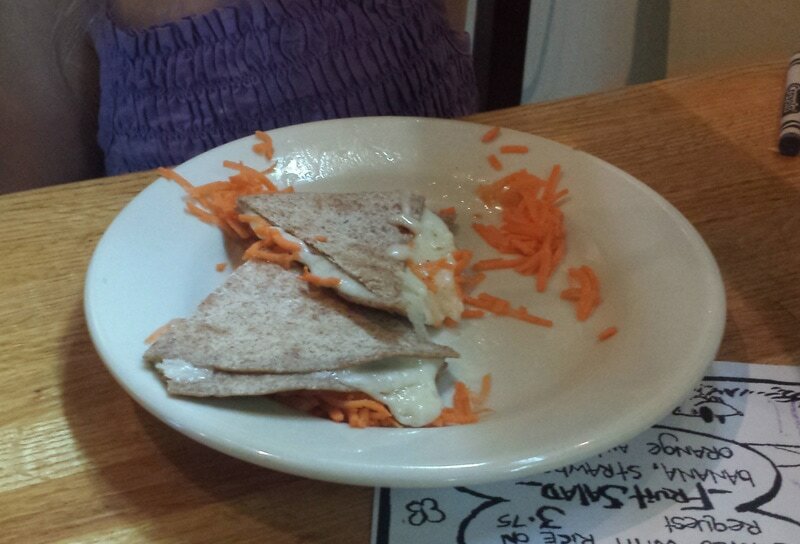 We got my older daughter a cheese quesadilla with carrots. That kid could live off cheese. My younger daughter ate some of our food. 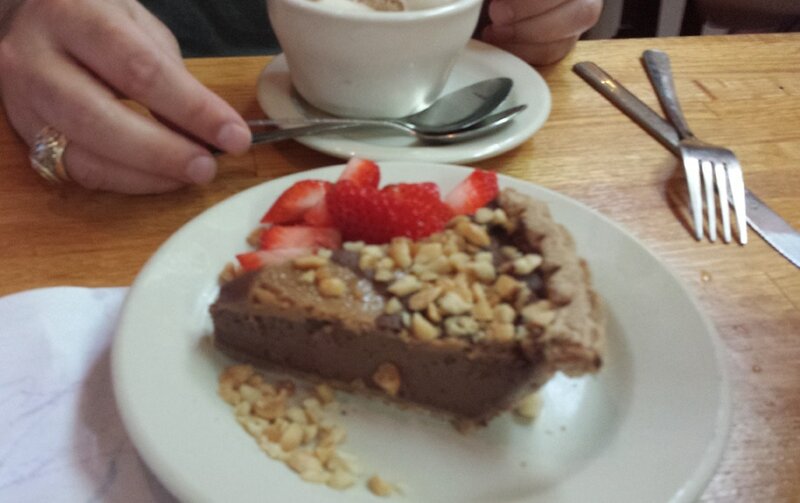 And since it was vacation, we also got a slice of peanut butter pie and some coconut ice cream for the girls to share. My younger daughter has a dairy allergy, so I loved that there was an option for her! Needless to say, we were stuffed when we left. Next stop was the Whole Foods Flagship Store! It was pretty amazing and I only managed to get one photo of the bulk section that is way bigger than any other I have seen. It was truly awesome. We grabbed a bit of food from the to go section for the hotel. Our hotel was great! We stayed at the Marriot Renaissance. They even had fruit infused water in the lobby. The fruit was grown in their garden in back of the hotel. How cool is that? It was late in the day by this time so we just took a walk around the hotel with the girls. We ate breakfast in our hotel room and then set out for a hike at McKinney Falls State Park. The park was great, but there were no falls to see since they had dried up. At least the hiking/bike paths were mostly shaded. For lunch we headed out to Bouldin Creek Cafe another vegetarian/vegan restaurant. Check out what their menu says. Awesome, right? My husband liked this place the best. He got the tamales and they were made with sweet potatoes and walnuts. I got their veggie burger which was homemade. Boring, I know! I just love a good veggie burger and it’s not often when you see a homemade one. The Asian slaw that came with it was my favorite part. My younger daughter loved it too. My older daughter got a grilled cheese and apple slices. She also ate the veggies on top of my burger. 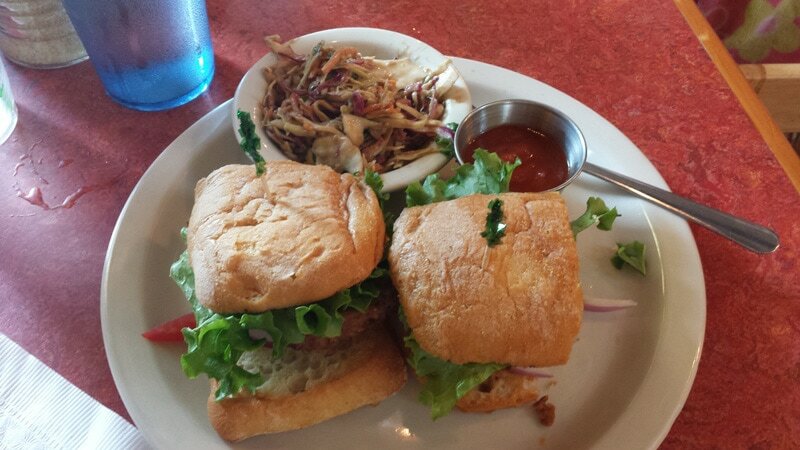 I liked the veggie burger at Mother’s Cafe better, but this one was good as well. Just too much bread. The last day, we headed out to Veggie Heaven, which is an Asian restaurant. I am sorry to say that we were not to impressed. Most of the food was fried and not very good. The prices were cheap and that is probably why it is so popular. I didn’t even take photos of what we ate there. My husband and I split some cabbage wraps and my daughters ate some rice and veggies. We ended up going back to Whole Foods on Lamar right before we headed out of town. We indulged in some vegan peanut butter mouse that was tofu based. It was really good and I am now working on a soy free version of it! So that was our Austin trip in a nutshell. We have plans to head back in the fall when the weather cools a bit. Check it out if you can! Haha you said you and your husband "spit" a cabbage roll. I know it was a typo, however it could be. Freudian slip since you were not pleased with the food. Sounds like you and our family had a great time. I so enjoy your posts. I am neither vegetarian nor vegan, but you have certainly educated me, and peeked my interest. Haha! It probably was a Freudian slip! Either way, thanks for letting me know and I am glad you are enjoying the posts! Yum! Glad you had fun in Austin! Thanks Amy! We loved it there! That all looks amazing! I love trying various veggie burgers. They're all so different. 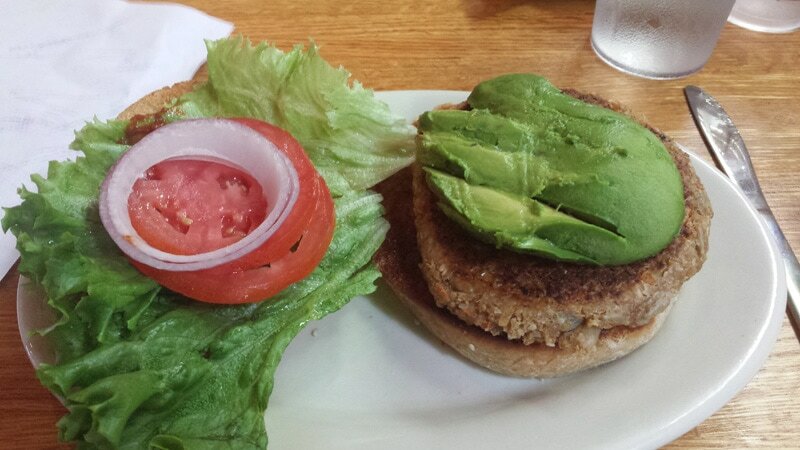 Whenever a restaurant offers a homemade veggie burger, it's hard for me to order something else! As for that Whole Foods...that's like my dream! If I ever visit it, I'll probably decide to just move in. I know, right? It was amazing! Sounds like you had lots of fun. The tamles looks very good.the whole foods, we would get spoiled. All the food was so good! This is perfect timing - we head to Austin in about a week and a half to see relatives, and it will be really nice to have some ideas for restaurants where I can eat! Glad it could help! We love Austin. Looks like a fun trip! 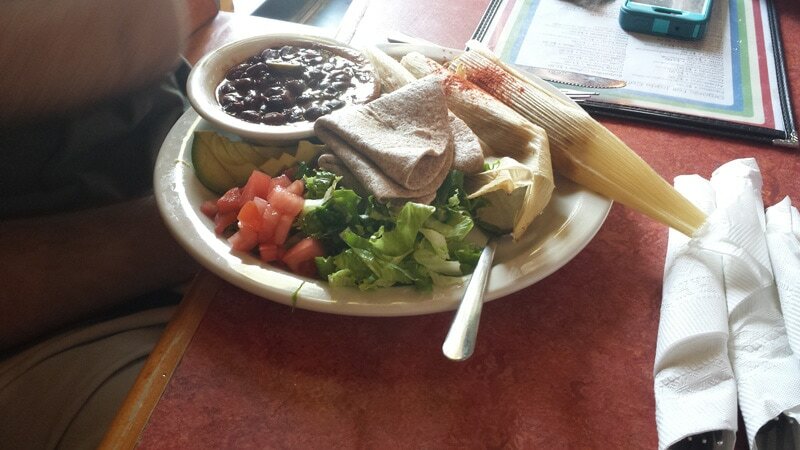 The next time you go to Austin, you HAVE to eat at Casa de Luz. They have a set meal each day so you have to call ahead or check their website (https://www.casadeluz.org/the-daily-menu) to find out what they'll be serving. All of the food is plant-based, organic, and oil-free. For $12 per person, you get a tea or water, soup, salad, and your main plate which always contains a grain, beans, mixed vegetables, dark leafy greens, and fermented vegetables. You really cannot beat the price and the food is wholesome. It was one of our favorite Austin finds, as well as The Steeping Room which has some vegan scone and cookie options if you want to sit down for tea and a snack.